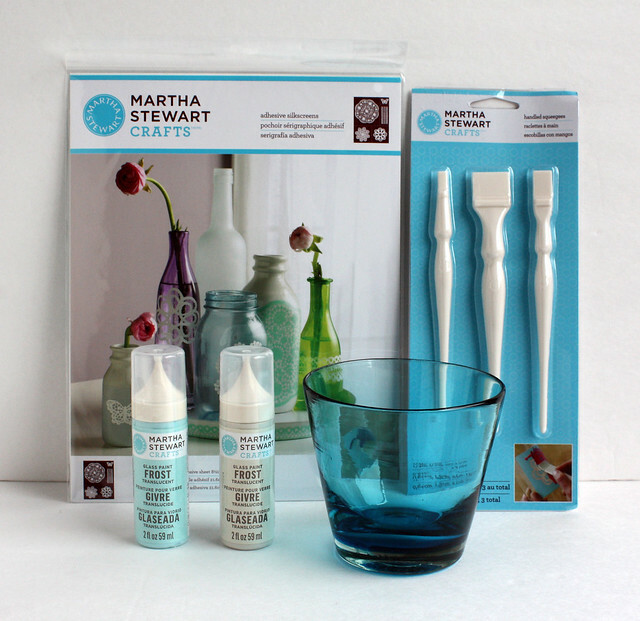 When I was offered a chance to try out Plaid’s new Martha Stewart glass paint, I was so excited. 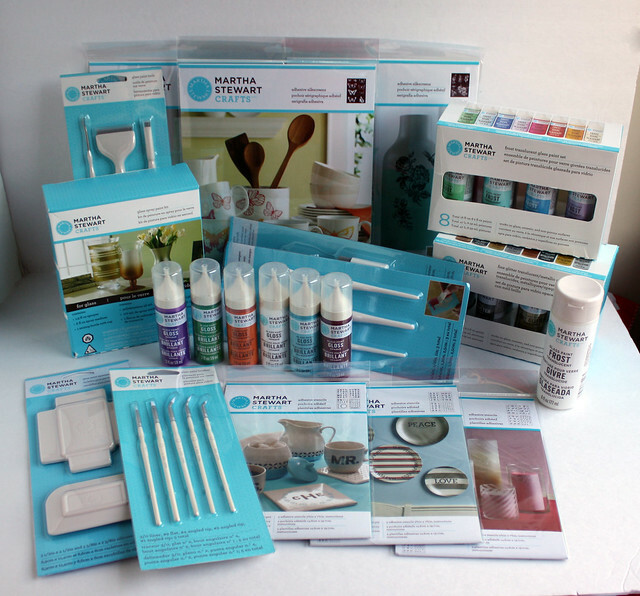 I had the opportunity to experiment with the Martha Stewart craft paint a few months ago and I’ve been happily incorporating it into projects since then so I knew I would have a lot of fun goofing around with these products as well. The folks at Plaid sent me this amazing array of products to experiment with. There were paints in 26 colors and an array of finishes: metallic, glitter, frost, gloss, transparent, opaque. The box also held letter templates in a variety of typefaces, silkscreens to make intricate images and all the tools I’d need to complete my painting projects. 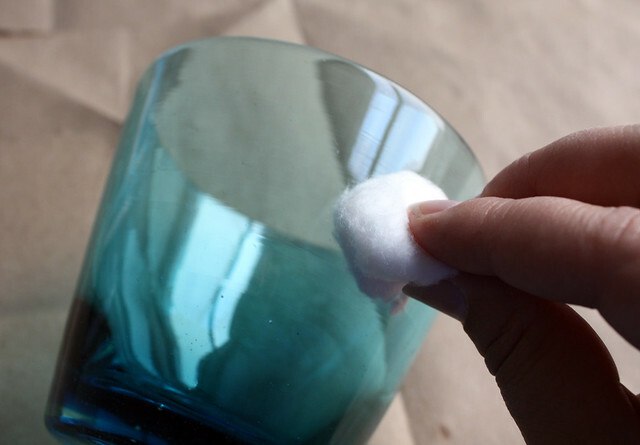 Begin by washing the glass thoroughly, then go over it quickly with a cotton ball dipped in rubbing alcohol. 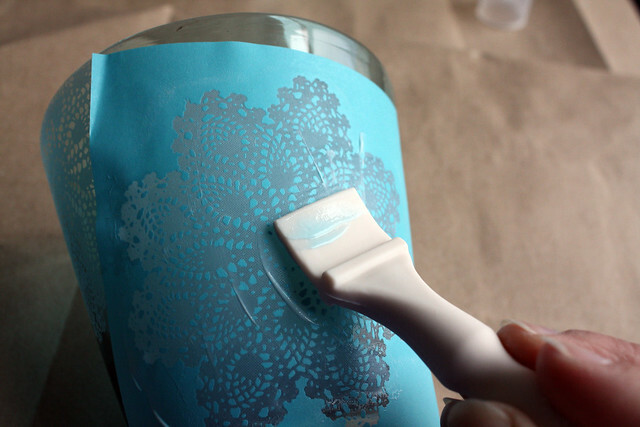 This will remove any hidden residue from the glass help the silkscreens adhere to your surface. 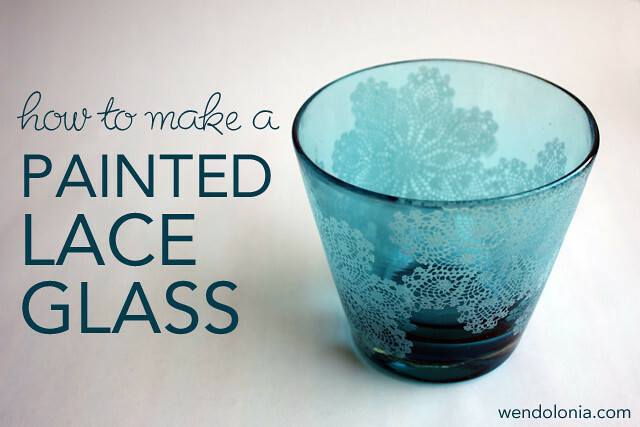 Next, place the silkscreen of your choosing on the glass and press firmly to make sure it’s evenly covering the surface with no air pockets underneath. I went with a medium size doily that resembles a snowflake and I staggered it each time I applied it to create a randomized pattern. Squirt a thin line of paint across the top of the silkscreen design. 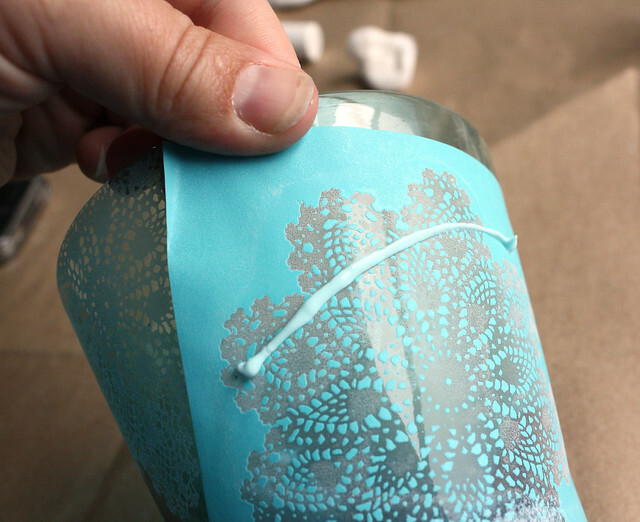 The pointed applicator on the paint bottle makes this easy. Use the squeegee to spread the paint evenly across the open area of the silkscreen. Remove the silkscreen as soon as you are finished. If you wait until the paint is dry, some of it will come off with the template. (Not that I learned that first-hand or anything….) Rinse your silkscreen under warm water and let both it and the paint dry. The paint will need about 30 minutes to set up before you can place the adhesive from the silkscreen over it. 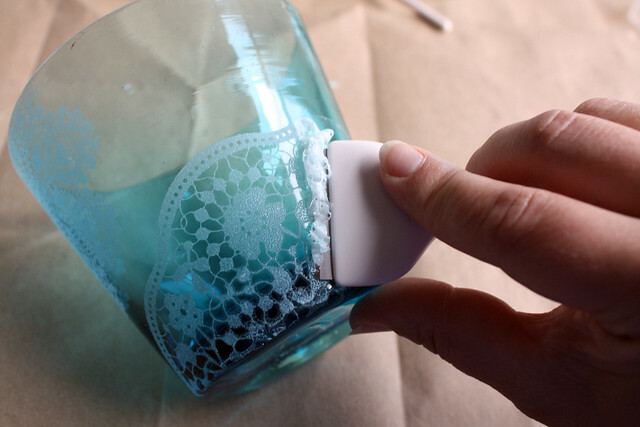 Repeat the painting process until you’ve added as many doilies as you like to your glass. Finally, allow your piece to cure. You can do this in one of two ways: let it sit undisturbed for 21 days or cure it in the oven. I chose the oven method. To do this, place your item in your oven before turning it on, then set the oven to heat to 350 degrees. This keeps the glass from breaking due to sudden temperature changes. Once the oven temperature has reached 350, bake the glass for 30 minutes. Turn the oven off and let the glass cool in the oven before removing it. 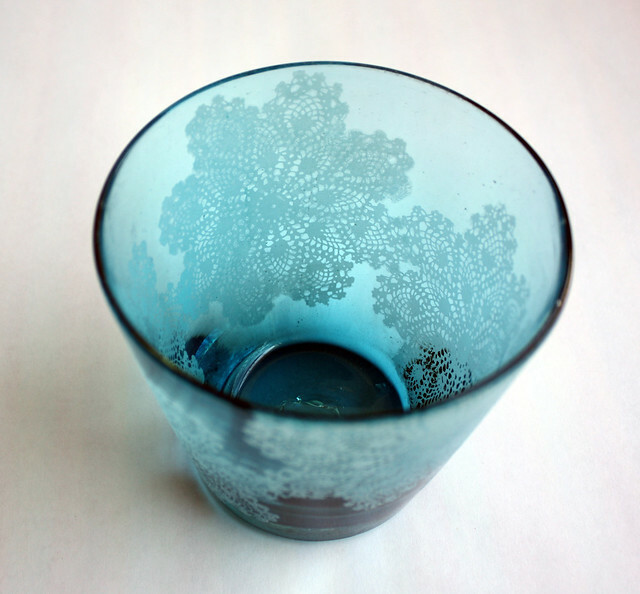 One other thing I’d like to note: at one point in the painting process I tried out a larger scale doily silkscreen, but I was not at all pleased with how it looked on my glass. To remove it, I simply scraped it off with one of the Martha Stewart glass tools scrapers that was included with my supplies. It came right off and you couldn’t even tell it was there in the first place. I do love tools that allow me to fix my mistakes! Here’s a shot of the finished glass. I love how detailed the lace is! The Martha Stewart glass paint isn’t food safe and because I painted right up to the rim of the glass, I’m not planning to use it for drinking. Instead I’m thinking I’ll use it for serving berries, putting flowers in or as a candy dish during the holidays. 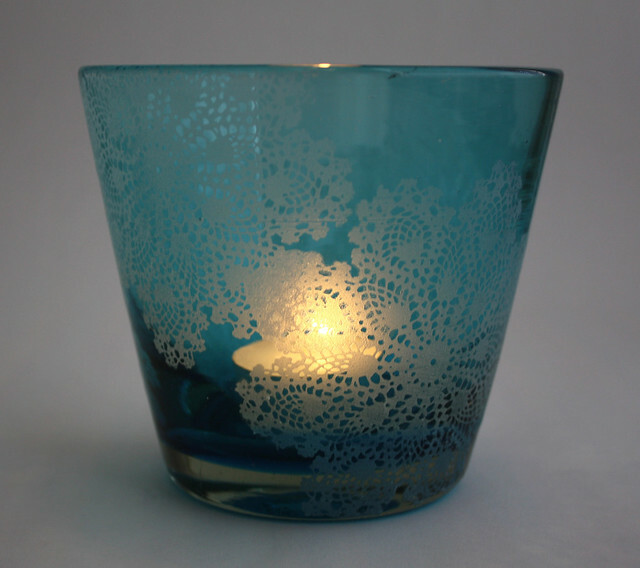 I’ve also taken it for a spin as a candle holder using a tea light and it was very pretty to see the light shining through the designs on the outside. Disclosure: I wrote this post as part of a paid campaign with Martha Stewart Glass Paints and Blueprint Social. The opinions and the rad project I showed you in this post are my own.